Let's be honest: there are gaps everywhere in life - the gap between who we are and who we would like to be; the gap between the Christianity we profess and the Christianity we practise; the gap between us and those we love; the gap between the world as it is and the world as it should be. We feel disconnected from God, from one another and from ourselves.How do we close those gaps? How is God working to make us whole?This book brings the gospel to bear on the gaps in our lives.Drawing on a highly unusual lifetime's experience living out the Christian faith in more than twenty countries, Graham Hooper shows how we can be made whole in the struggles and joys of everyday life - work and relationships, success and failure, service and weakness. 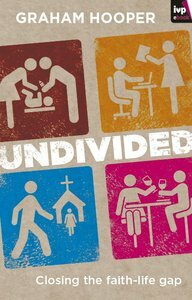 About "Undivided: Closing the Faith-Life Gap"
Customer Reviews For "Undivided: Closing the Faith-Life Gap"
Undivided, by Graham Hooper is a book about what we do with these contradictions in our lives, both individually and corporately. These reflections are offered from one who has worked to connect his "sacred" faith with his life and "secular" work as an engineer. Early on the book points out two understated virtues of Jesus, his integrity and his honesty. As he engaged with a broken world, Jesus didn't simply offer stoic indifference, nor validation of things as they are, but offered hope through God's reconciliation and renewal of all creation. The book continues and offers the challenge of asking what it can look like for us to live out an authentic faith wherever we happen to find ourselves. In a lot of ways the book takes the time to state that which is obvious but easy to forget. To offer practical examples of "What can it look like" to live a Christian life when confronted with success, failure, temptation and tough decisions. These examples aren't simply theological ponderings but arise from Christian reflection on personal and professional experiences of the author, his family and others who he has shared with throughout his life. It is a reminder of the importance of keeping sight of the big picture and being shaped by God's hope for both ourselves and the world. It is also a good reminder that the most important parts of our ongoing discipleship will happen outside of Sunday worship.. I really enjoyed this book. In short, it is full of wisdom that has been accumulated over years of walking with God and living successfully. I found it very easy to read and I was constantly encouraged by the stories, quotes, and Biblical truth that the author weaves together so well. I enjoyed this book so much that I gave a copy of it to a young mother and she said, "It was the best book on the Christian life I've read in years!" I think the brilliance of the book is that it helps us to THINK about these truths and apply them to our (often divided) lives without even realizing what it happening. I am thankful for this book and I will certainly be recommending it others. "Undivided - closing the faith-life gap" is a thoroughly enjoyable read. Full of practical and wise advice for closing the gap between what we ought to be as Christians and what we actually are from day to day in the places where we live, work and play. Building on his extensive experience in the world of work and business, Hooper provides extensive and thoughtful insight into everyday problems and challenges that Christians face in expressing their faith beyond the walls of Sunday church: coping with change, dealing with success and failure, making a difference in the workplace and so on. The really impressive aspect of the writing of this book is the consistent and appropriate use of the Scriptures to underline, support and exemplify the issue being discussed. This is not writing that tries to find a verse here and there to support a pre-determined perspective. This is writing that starts with the Bible and allows the Holy Spirit to use the text to teach, discipline and shape the reader; to close the gap between the reality and hope. One senses that this has been the experience of the author throughout his career and explains why he is able to write with such wisdom and insight. As I read, I could not help thinking that this would make an ideal gift to a young Christian who was about to enter the workforce - blue collar, administration, university graduate etc. Chapter by chapter they would find encouragement and direction to be whole-life disciples and not "Monday-morning atheists'. This book if a great read. It is embedded in life itself. Graham has a distinct flair for meeting life just right where it is at. The book is so down to earth, related to life in a meaningful way and linked to heaps of quotes which connect so well. I had to admire the way that Graham has drawn on Bible readings and other quotes that fit so well to the discussion at hand. He has done a great job at linking the Bible stories with modern day life - and in a realistic and convincing way. Graham draws on his own experiences and his Christian journey in such a powerful and natural way. His quotes cover a wide range of references and this book is very well researched demonstrating the author's very real command of the Christian journey of life. The book is so easy to read. I found myself being drawn to the convincing examples of life the Graham draws upon. This is practical Christianity in the real world!